← Is That a Gun in Your Pocket? This entry was posted in pistol and tagged revolver, single action. Bookmark the permalink. 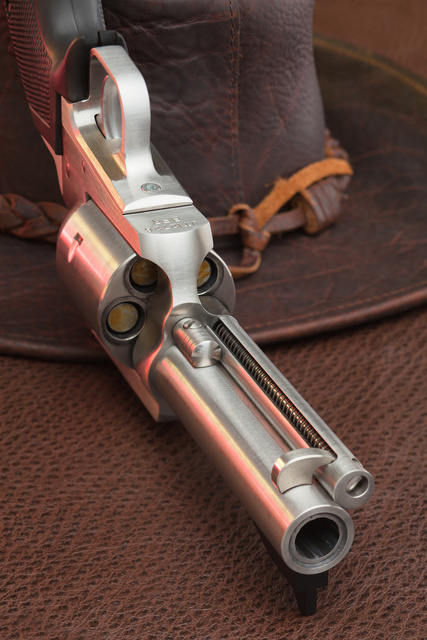 5 Responses to Single action details. You were correct, at least as far as the origin of the “BFR” label. Word is that “Frame” was substituted later, for obvious decency reasons. Many shooters share old-fashioned values. and there is a barrel inside the barrel. always assumed it was a one piece affair with revolvers. great “crisp” picture, as always! I look at the bore and go “day-um!”.